It is a false belief that seniors are not allowed to engage in any outdoor physical activities. Hiking activities for seniors have been one of the most engaged in activities by seniors who are following a fit and healthy lifestyle. However, even if seniors are already used to hiking, or even hiking on various trails, they are still very prone for accidents and injuries. If seniors really wish to take a hike on mountain trails, they have to make sure that their body (endurance, physical condition, etc.) is in a perfect condition. Hiking activities can’t only be done on mountain trails, it can even be done on parks, malls, your neighborhood, and practically anywhere. 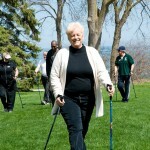 Walking poles will not just provide balance to seniors who are going to use them, walking poles have a lot more health benefits to offer. 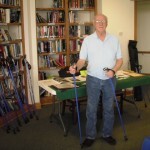 One of which is that walking poles can help in relieving stress and pressure on the lower back and the rest of the lower extremities, which are more prone for injuries and strain especially during senior years. Just as long as seniors can get their hands on a perfect walking pole, then they can surely gain all its benefits. 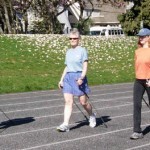 It is very important to keep in mind that the main purpose of walking poles is to provide extra support and balance to seniors during various walking activities, including hiking activities. To gain the most out from your walking poles, you have to take into careful consideration about the user’s personal needs and capabilities. 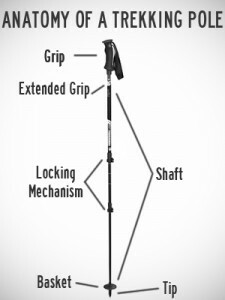 The user’s present physical condition, strength, and capabilities are important factors when choosing walking poles when it comes to the shape and materials used. 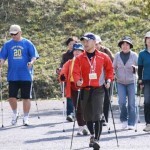 For seniors who have weak lower body, walking poles with absorb shock feature are recommended. 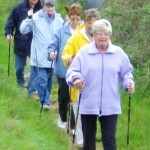 And for those who are in perfect physical health, standard walking poles will do. Length for a perfect walking pole will greatly depend on the user’s height. The user should measure his or her height prior to buying a walking pole. If you wish to use lightweight walking poles, you should keep in mind that most lightweight walking poles are more expensive than heavier ones. 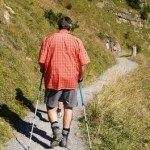 Many people can attest that lightweight walking poles are undeniably more comfortable to use than heavy walking poles. However, there are some people who find heavier walking poles more comfortable to use than those lightweight walking poles.